Pickled by Kelly Carrolata (Amazon | Powell’s) – This book runs the pickling spectrum. You’ll find everything from a class dill pickle to refrigerator herring. There are some recipes here that are designed for the water bath, but most are to be used and eaten promptly. Another fine feature of this volume is the fact that about a quarter of the recipes are ones to help you use up what you’ve put up. Quick Pickles by Chris Schlesinger, John “Doc” Willoughby, and Dan George (Amazon | Powell’s) – This book is a celebration of the unprocessed pickle and serves up inspiration every time I flip through its pages. It does show its age a bit as far as the names of the recipes go (no one would name something Korean-Style Cabbage Pickle in these times, they’d simply call it Quick Kimchi), but the fact remains that it has plenty to offer. The New Preserves by Anne V. Nelson (Amazon | Powell’s) – I bought this book for its pickled cantaloupe recipe and keep it around for its sweet pickled carrots. Just don’t make the three bean salad – there’s not nearly enough acid in that recipe for boiling water bath canning. Asian Pickles by Karen Solomon (Amazon | Powell’s) – If you want to pursue authentic pickles from Japan, Korea, China, India, and Southeast Asian, you want Karen Solomon by your side. This book is a masterful piece of recipe development and curation. And since many of the traditional pickles from those parts of the world are kept with processing, much of the book is perfect for this month’s challenge. The Pickling Handbook by Karin Bojs (Amazon | Powell’s) – I included this book in the round-up because it is beautiful. It offers a handful of pickling recipes, as well as bunch of recipes to help you use up the pickles you’ve made. The Joy of Pickling by Linda Ziedrich (Amazon | Powell’s) – Linda Ziedrich is the high priestess of home food preservation (I anxiously await her forthcoming book on savory jams). The third edition of her pickling book came out last summer and is bursting with all manner of pickled delight. If you only own one book on pickling, this should be it. The Pickled Pantry by Andrea Chesman (Amazon | Powell’s) – This is a big, friendly book with lots of pickle knowledge to offer. Andrea processes most of her pickles, but many of the recipes could be easily done as quick pickles. She’s got one section where the recipes are all scaled for a single jar, making them easy for the small batch aficionado. Pickled & Packed by Valerie Aikman-Smith (Amazon | Powell’s) – Pickled rose petals! Boozy bread and butter pickles! Pickled makrut lime leaves! This book is the one I pull down when I need something to wake me up and get me thinking about pickling in a whole new way. Beyond Canning by Autumn Giles (Amazon | Powell’s) – I love Autumn’s flavor sensibility. She has a way of combining ingredients that is creative, delicious, and accessible. Recipes in this book that would work particularly well for the challenge include Kombu Dashi Pickled Shitake Mushrooms, Curried Orange Pickle, Bloody Mary Pickled Eggs, and Quick Pickled Rhubarb. 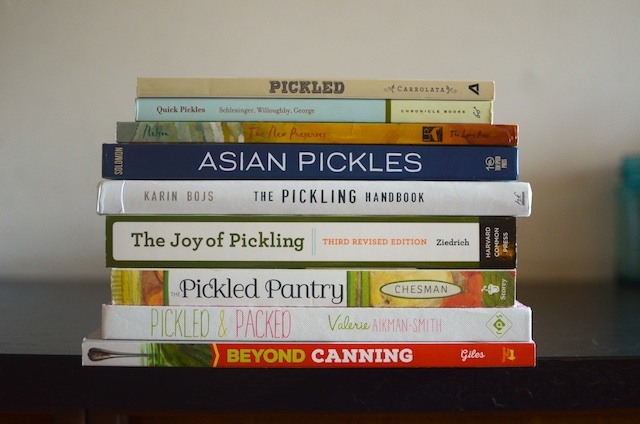 This a great rundown of pickling books. Thank you so much! Hi Marisa, thanks for listing some great resources, did not know there was so many books about pickling out there. There are even more pickling books out there. These are just the ones that I felt would be useful for this challenge!